Courtesy Pieve dei Santi Michele e Francesco, Carmignano. The monumentality of the four female – and almost floating – figures captures this crucial moment in the story of Christianity. In Christianity, the Visitation is the auspicious encounter between two cousins, as recounted in the Gospel of Luke. Mary visits her relative Elizabeth while they are both pregnant: Mary with Jesus, and Elizabeth with John the Baptist. We see the young, pregnant Virgin Mary graciously greeting her elder cousin Elizabeth, who is also with child. There is a riot of vivid colors: hot pink, pale pink, orange, olive, magenta, cerulean blue, luscious white and even electric mint green. 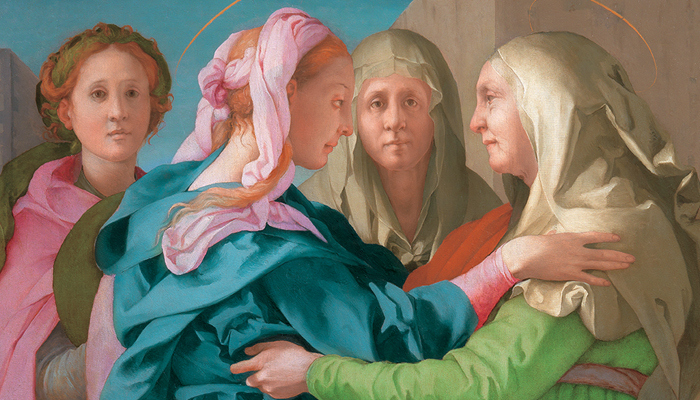 The Florentine painter Jacopo da Pontormo (1494–1557) immortalized this meeting at the end of the 1520s, when he created one of his most moving and groundbreaking paintings; the innovative altarpiece of the Visitation. Never shown outside of Italy before now, the magnificent and towering work, with its vibrant hues, is now on display at the Getty Museum through April 28, 2019. Pontormo’s large-scale work was created by him at the time of the siege that brought to an end the last Florentine Republic (1529–1530). Recent conservation has created the extraordinary opportunity for the work to travel to Los Angeles for the first time from Carmignano (near Florence) to the United States. This rare exhibition presents Pontormo’s spectacular painting alongside its preparatory drawing and two exceptional portraits painted during the same tumultuous period. This small but thoughtful exhibition is designed to put the Visitation in its proper context. The result is quite an extraordinary feast for the eyes! In Catholicism, it is held that the purpose of this visit was to bring divine grace to both Elizabeth and her unborn child. Even though he was still in his mother’s womb, John became aware of the presence of Christ, and leapt for joy as he was cleansed from original sin and filled with divine grace. Elizabeth also responded and recognized the presence of Jesus, and thus Mary exercised her function as mediatrix between God and man for the first time. The recent restoration of this masterpiece of Mannerist art has created the extraordinary opportunity for the work to travel for the first time from Carmignano (near Florence in Italy) to the United States. Pontormo: Miraculous Encounters presents Pontormo’s spectacular altarpiece together with its preparatory drawing and with another masterpiece by the artist, the Portrait of a Young Man in a Red Cap (Carlo Neroni?). 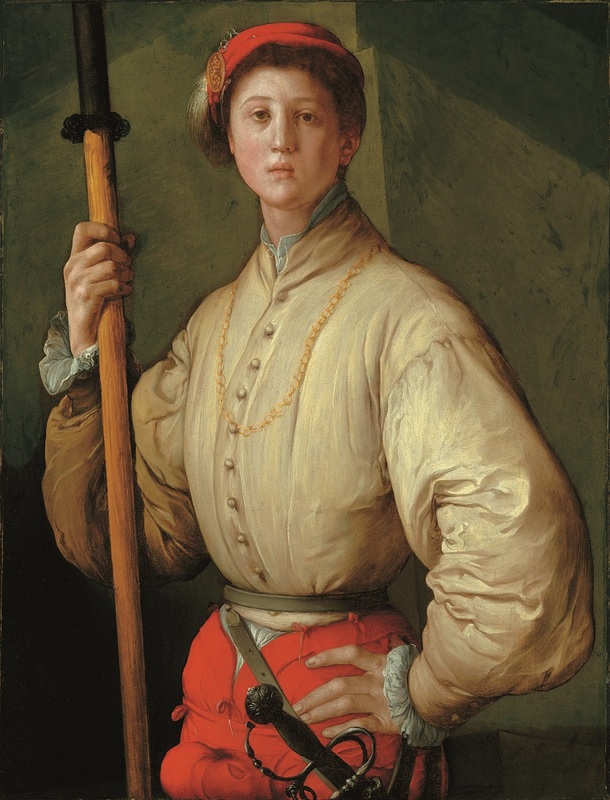 Pontormo painted this portrait of the handsome yet enigmatic young man during the same dramatic months of the siege of Florence. Believed to be lost, it has only been recently rediscovered in a private collection in Europe. Portrait of a Halberdier (Francesco Guardi? 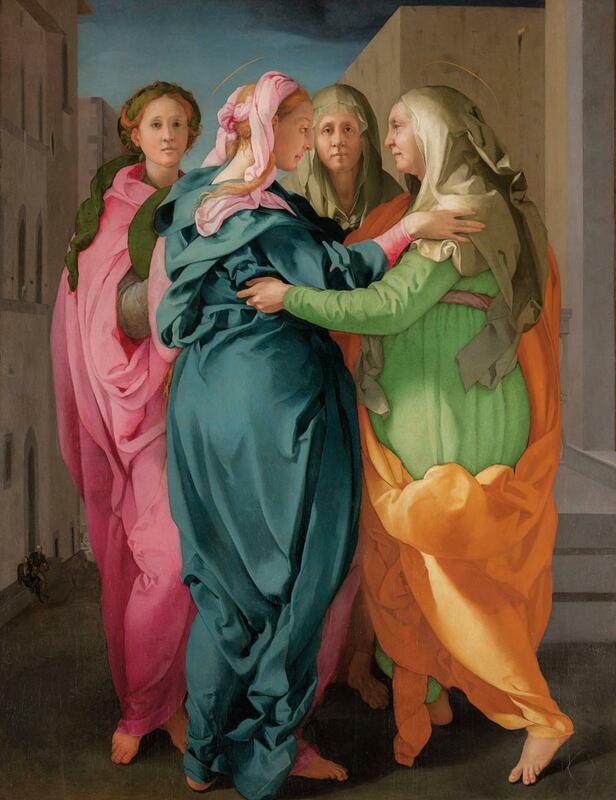 ); Pontormo, J. Paul Getty Museum (Los Angeles).